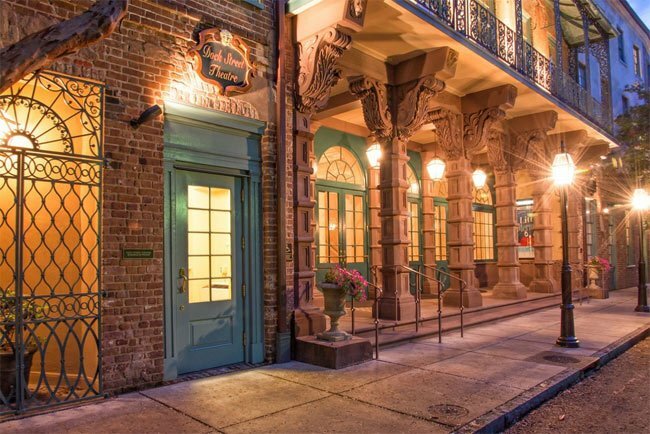 Dock Street Theatre in historic Charleston – located at what is today the corner of Church and Queen – is often touted as America’s first theater, meaning that it was the first building in the United States designed exclusively for theatrical performances. The story is actually a bit more complicated … and interesting. South Carolina’s first known actor came to our shores in 1703. An erstwhile attorney named Anthony Aston, he hailed from England by way of New York and later described his stay in our state as follows: “Well, we arriv’d in Charles-Towne, full of Lice, Shame, Poverty, Nakedness and Hunger: – I turned Player and Poet and wrote one Play on the Subject of the Country” (1). This play, never found, may well have been the first composed in America (2). Despite these humble origins, residents of what was then called Charles Towne appear to have developed a taste for drama, and further plays were organized here by at least 1735 (3) and maybe as early as 1712. In that year, the Statutes at Law of South Carolina contained a Sunday prohibition against “bear-baiting, foot ball playing, horse-raceing [sic], enterludes [sic], or common plays” (4). These performances usually took place in one of two disparate locations – local taverns or Council’s Chambers (5). At that time, the Grand Council met at the intersection of Broad and Meeting, on the site of today’s Old Exchange (5). With large interior spaces, public buildings like this one sometimes played host to gatherings such as parties, plays, and concerts (5). The same went for the city’s taverns or public houses (“pubs”) – places where men went to eat, drink, and meet. For example, the South-Carolina Gazette posted this advertisement in January 1735: “On Friday, the 24th, inst. [this month], in the Court Room, will be attempted a tragedy called ‘The Orphan: or, The Unhappy Marriage'” (3). At that time, the Court Room could be found in Charles Shepheard’s tavern at 46 Broad Street, just one block south of the existing Dock Street Theater. A long hall, the Court Room acquired its name upon being “rented for several years prior to 1738 to the provincial government for meetings of the court, since the Province had no suitable building and the Governor and Council could not agree on where one should be built” (6). All this being said, the first evidence of an actual theater venue in Charleston – built explicitly for that purpose – dates from another advertisement in the South-Carolina Gazette, published on January 24, 1736, which reads, “On Thursday, the 12th of February, will be opened the new theatre in Dock Street, in which will be performed the comedy call’d ‘The Recruiting Officer'” (3). From this single source, some have surmised that the Dock Street Theatre “was the first building in America built exclusively to be used for theatrical performances” (7). In actuality, the old theater, which does not appear to have been called Dock Street Theatre but simply “the new theatre in Dock Street,” was predated by a theater built in Williamsburg two decades before (8). It is also important to note that the current auditorium is not yet even 80 years old. Dating between 1935 and 1937, what we now think of as the Dock Street Theatre was built after the Great Depression under the direction of the WPA, using the 19th-century facade of the former Planters Hotel (6) and “remnants of 18th-century buildings that were incorporated into [that] larger nineteenth-century structure” (9). The only pieces of this building that are believed to have been part of the original 1736 theater are a few “fragmentary brick walls” (9). How did the original theater fare? Not well, we’re afraid. The proprietor of the theater was likely the same Mr. Shepheard who owned the Court Room, as it is known that subscriptions for a winter season were organized by him and collected at his Broad Street location in 1735 (3). It was managed by either him or dancer-turned-thespian Henry Holt, who posted sale of the building just four months after its first performance. A notice in a May 1736 edition of the South-Carolina Gazette announces the sale as follows: “To be sold to the best bidder on Wednesday next the 12th instant at the Theatre in Queen street, one half (or the whole) of the said Theatre with the ground thereunto belonging, containing front in Church-street 57 feet, depth 119 feet, with all the scenes, cloathing [sic], &c.” (4). The old adage that says “the show must go on” must have been in effect, however, for at least three different titles were advertised during the period between November 1736 and January 1737 – Cato, The Recruiting Officer, and Flora, which had been executed at the Court Room in 1735 (4) in what is widely regarded as America’s earliest operatic performance. Also, in spite of the sale, Henry Holt continued to host dance classes and balls there (4). These performances were likely given in the same structure, which by then appears in advertisements as the “Theatre in Queen street” and “the new theater, Queen Street” (3). The reason for this shift is that Dock Street had been renamed Queen Street. This change was authorized by an Act of Assembly to honor of Caroline of Anspach, wife of George II (10). Though the revision was made in 1734, it does not appear to have taken hold – at least in common parlance – until 1736. After this point, the history of the original theater becomes even cloudier. Some say it was out of commission by 1738 (11) and subsequently destroyed during the fire of 1740 (12). The blaze stopped one block short of the theater, however (13), and further notices in the Gazette promote balls to be held at “the theater in Queen Street” in 1743 and 1744 (3). Thus it is possible that the original theater either survived the fire or was rebuilt. There are no clear references to the venue after this decade, and by October 1754, a “New Theatre in this town was opened” (3). The location of this “new theatre” is not listed, and it may or may not have been located near the site of Charleston’s earlier playhouse. One researcher has suggested that the Queen Street theater may have succumbed to the hurricane of 1752 and been rebuilt after that time (14). Another researcher suggests it was rebuilt in 1754 after a fire (9). In the decades and centuries that followed, the plot of land on which the old theater was located has supported everything from a grand hotel to a crumbling tenement (6). Today, it is home to a small but elegant theater, called the Dock Street Theatre in homage to Charleston’s long-ago stage. Incidentally, in a multitude of historic sources, the venue was called Queen Street Theatre far more often than it was called Dock Street Theatre. In fact, the South-Carolina Gazette‘s 1735 reference to the “new theatre at Dock Street” is the first – and last – we could find. The Planters Hotel opened in 1803 at the site of the current Mills House Hotel at Meeting and Queen streets. In 1806 Mr. and Mrs. Alexander Calder bought the hotel from James Thompson and operated it until 1809 (15). That same year, the couple purchased “a large and commodious house at the corner of Church and Queen Streets,” or the site of the former theater on Dock Street, and relocated their business to the new property (5). The Calders renovated, expanded, and transformed the townhouse – which had replaced the theater sometime in the late eighteenth or early nineteenth century – into a renowned hotel (9). Wealthy planters and other elite guests frequented the Planters Hotel, well-known for its hospitality. 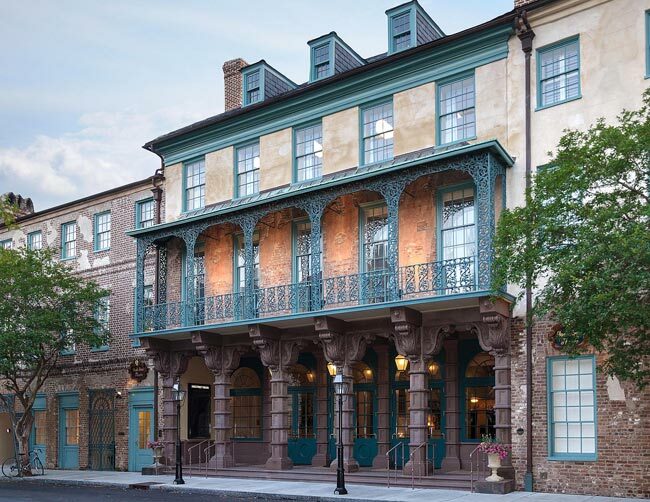 Actor Junius Brutus Booth, father of John Wilkes Booth, was a guest here in 1838 while in town for a performance at the nearby Charleston New Theatre (16). He is said to have attempted to murder his manager, a man by the name of Flynn, in one of the hotel’s guest rooms (17). Another legend surrounding the Planters Hotel is that it was the birthplace of the cocktail, Planter’s Punch (9). The Planters Hotel was enlarged again in 1816 to include nine new guest rooms. It had been under the management of Orran Byrd prior to that year while the Calders were in Europe. The business changed ownerships in subsequent years. By 1855 businessman J.W. Gamble purchased the hotel from John O’Hanlon and renamed the establishment the Calder Inn for its original owners. It was likely under Gamble’s ownership that the building’s main Church Street entrance was added, along with its recessed porch, banded brownstone columns, and iconic ironwork balcony (5). Forced to close during the Civil War, the hotel reopened soon afterwards (5). However, by 1885 the building was used as a “cheap tenement,” and by the 1930s the building was uninhabitable (6). Due to the work of local preservationists, an effort guided by Mayor Burnet Maybank allowed the city to buy the property and to be restored by the Works Progress Administration as part of Roosevelt’s New Deal. 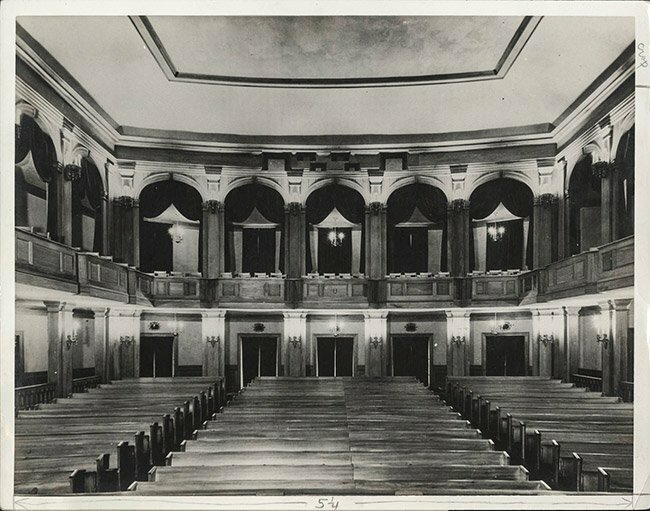 Construction began in 1935, and an auditorium was built in the courtyard of the former hotel (6). 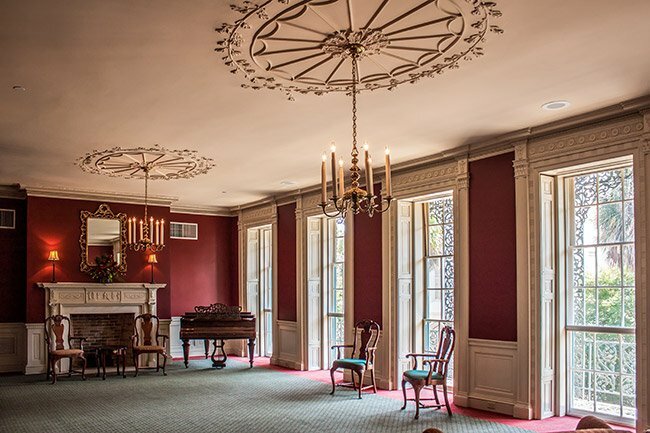 Interior features of the project include Adamesque woodwork and decorative plasterwork removed from the Thomas Radcliffe House at the intersection of George and Meeting Streets, a structure built in 1802 but demolished in 1935 and replaced with the College of Charleston gymnasium (9). 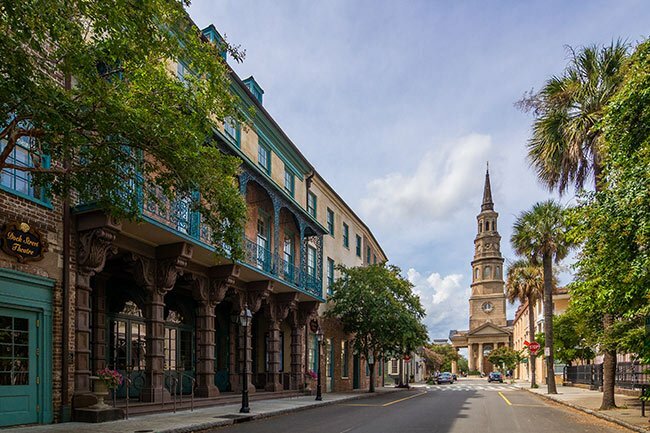 In 1937 the Dock Street Theatre, named for the original Charleston theater built on Dock Street (now Queen Street), opened with a performance of The Recruiting Officer, the first play performed in the original theater in 1736 (5). It has been a popular venue for local theater ever since, offering its stage for various performances during Spoleto Festival USA, an international arts festival spanning seventeen days. 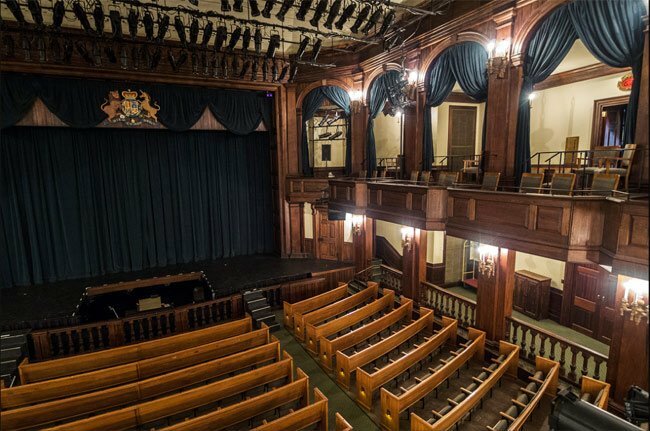 The Dock Street Theatre closed in 2007 for three years to undergo a $15.6 million renovation, which included the installation of steel rods in the brownstone columns to help secure them during earthquakes. In fact, 40 percent of the brownstone columns are comprised of new stone, collected from the same quarry in Connecticut as the original brownstone (19). The theater reopened on March 18, 2010, and a celebration gala included a performance piece from The Recruiting Officer (20). Sue Hiott of Clemson University notes the significance of WPA art in many of our public buildings, particularly the fresco that graces the courtyard of the Dock Street Theatre as well as four oil paintings in the tap room and above the lunettes in the lobby, done by artist William Halsey. At the time, Halsey was an art student at Boston Museum School. The original Halsey fresco did not survive the years of exposure to the fountain beneath it, but it has since been recreated. 1. Watson, N. & Cibber, C. (1920.) Anthony Aston, Stroller and Adventurer. Berkeley, CA: University of California Libraries. 2. Hughes, G. (2007.) A History of the American Theatre, 1700-1950. New York, NY: Oliphant Press. 4. Johnson, O., & Burling, W. J. (Eds.). (2002.) The Colonial American Stage, 1665-1774: A Documentary Calendar. Madison, NJ: Fairleigh Dickinson. 6. Stockton, Robert P. (1985.) Information for Guides of Historic Charleston, page 200. Charleston, SC: Self-published. 8. Wilmeth, D.B. & Bigsby, C. (Eds.). (1998.) The Cambridge History of American Theatre. New York, NY: Cambridge University Press. 9. Poston, J. H. (1997.) 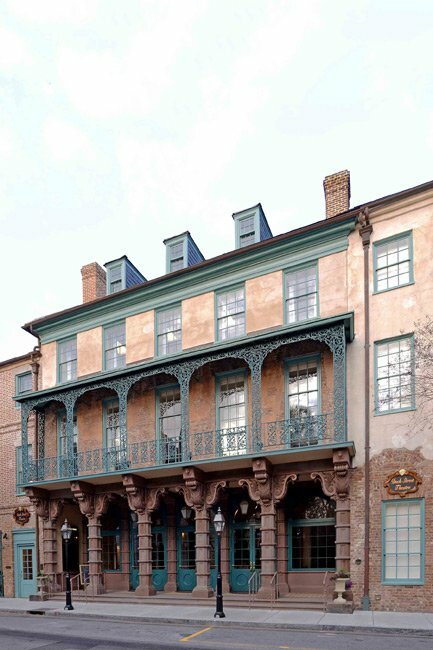 The Buildings of Charleston: A Guide to the City’s Architecture. University of South Carolina Press: Columbia, SC. 10. Claude Nueffer, Ed. (1964-1065.) Charleston Alleys. Names in South Carolina, 3, 25. 13. King, W. L. (2009.) The Newspaper Press of Charleston, SC. Charleston, SC: BiblioLife. 14. Rankin, H. F. (1965.) 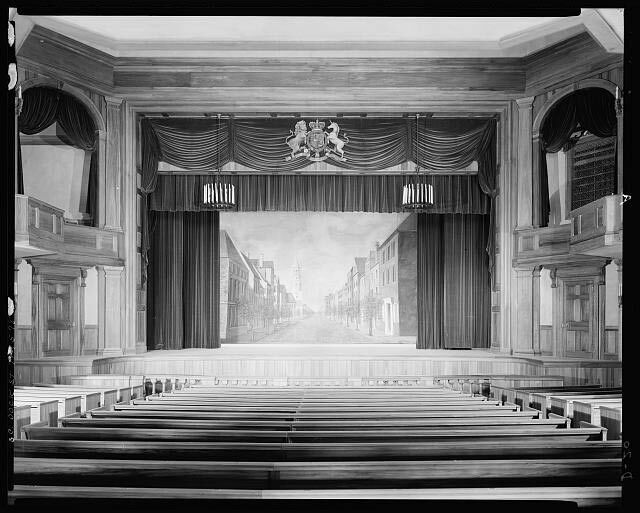 The Theater in Colonial America. Chapel Hill, NC: University of North Carolina Press. 17. Robinson, Emmett, M.F.A. (1963.) A Guide to the Dock Street Theatre and Brief Resume of the Theatres in Charleston, SC from 1730. Footlight Players, Inc: Charleston, SC. 19. Behre, Robert. (2009, May 31.) Down By Dock Street. The Post and Courier. (Retrieved 2014, February 26). 20. Parker, Adam. (2010, April 2.) 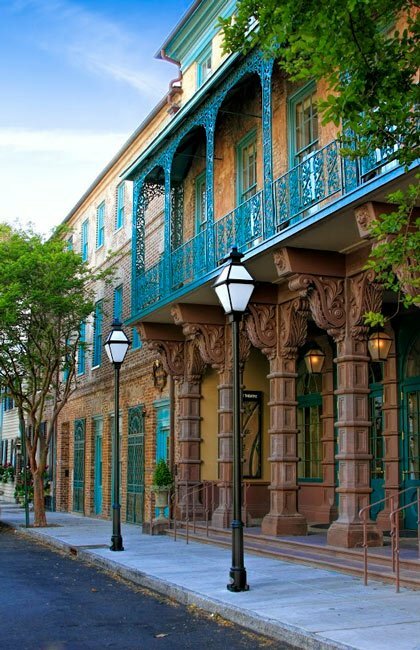 Dock Street Reopens With Spoleto Gala. The Post and Courier. (Retrieved 2014, February 26). Interesting and a bit I did not know but I can connect a few dots. The local architects were Simons and Lapham (Albert Simons and Samuel Lapham). They formed in 1920 doing early historic preservation and new construction. They designed the College of Charleston Gym at Meeting and George and, in typical fashion, removed the Thomas Radcliffe House and reused the parts elsewhere. Reused parts are also seen at 4 Greenhill Street (Lapham residence and if I recall uses Radcliffe House items as well, along with several other historic house elements from other projects). The old service station on Meeting next to the Fire Proof Building uses Manigault House material and is another example. It was common for them to reuse historical elements in both new or preservation projects. For more see Blevins, Documentation of the Architecture of Samuel Lapham and the Firm of Simons and Lapham, MFA Thesis, Savannah College Art and Design, 2001. The Dock Street Theatre’s history is even more interesting than I first thought! Thank you for publishing this very well-researched article with us so that we can understand more about this building and the history of theater in this country more generally.